Went up alone. Walked all over Devil's Ridge grouse hunting - well that's a big exaggeration, but I did cover a fair piece of it. Flushed only two. They were in the taller timber at the north end. No shots. First, I went to the rocks out on the northeast ridge. Still as impressive as I remember them. In the morning light, the bigger rock piles looked like graves, very old graves. Found one stone on the face of the far rock pile, over looking the little cliff, that showed it was apparently erected. It was the only vertical one within at least a 100' x 100' area or 10,000 square feet. In fact, I think the area was bigger than that. I found some more of what I took to be old moss covered stacked rocks. I carefully checked the other stacks I had noticed the first trip and my memory held good. 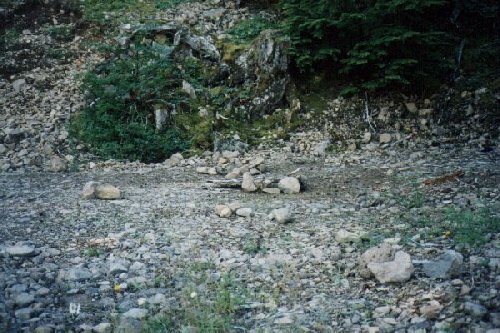 After I looked around the rocks, carefully I might add, I drove back down the gravel road and parked at where the close part of the 130 spur started. I walked a big 2/3 circle around that road. There was 30'-40' regrowth on the south side leading into what was probably virgin timber. To the north, going up the mounded ridge, was scrubby regrowth. From the age of the downed waste, I'll bet it had been logged well over 10 years ago and there just wasn't much coming back. Might have been the altitude. 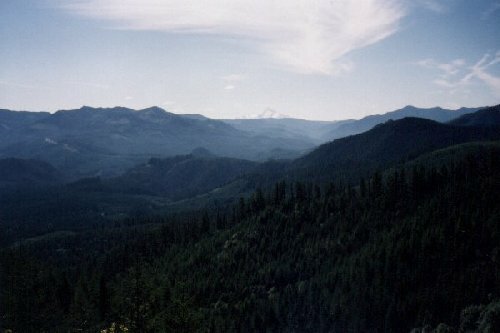 The Forest Service had ripped up short portions of some of the logging skid roads along it. The actual ridge of Devil's Ridge, as I could tell it, was along the west side. It wasn't like a cliff at all, just very steep and not able to hold a road. Still can't figure the name. Some of that area was fenced off to keep the deer and elk out of the regrowth. Maybe the fence helped, I couldn't tell. Toward the end of the fence, I went downslope just a bit and climbed up on a big old stump and took in the view. It was grand. Oak Grove Butte was right in front of me and the saddle between the Butte and the Ridge looked to be prime holding terrain for elk and deer. Off to the left, the big Bonneville electrical power lines ran to the west. They had a wide swath of cleared ground under them. 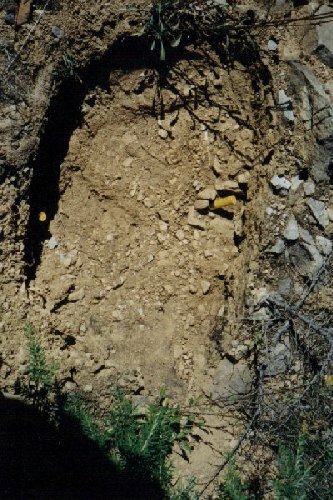 That ground was filled with bushes growing good food for the elk and deer. Then I got to the northwest end and the road circled to the east through the last of the virgin timber at that end. Kind of strange. The Forest Service left patches of big timber at each end and took everything in between out at various times from all appearances. Along the north end, there were two more logged strips leaving standing timber between them. That made three stripes of reprod going down the slope toward Devil's Spring. Funny looking. Why didn't they just log the place off and be done with it? Anyway, it was a beautiful walk and it was time to go back. I back tracked and when I got out of the tall timber, I cut up to the ridge proper through the regrowth. It wasn't hard since the central part was just like a big mound. It was just a ways to go. Off and on, I could use some of the old skid roads to get back to the truck. Thought for sure I'd flush some quail or grouse, but didn't and didn't even hear any of them. I was tired when I got back to the truck. I easily had covered 3 miles plus on the ridge. I decided to go back over Oak Grove Butte as Hwy 46 was still closed for construction and I wanted to spend a little more time out. First, I took the #20 spur and then the #10. Along it, sort of overlooking the road up to High Rocks and Mt. Mitchell on the other side of the Oak Grove Fork of the Clackamas River, I stopped. First it was a good view. 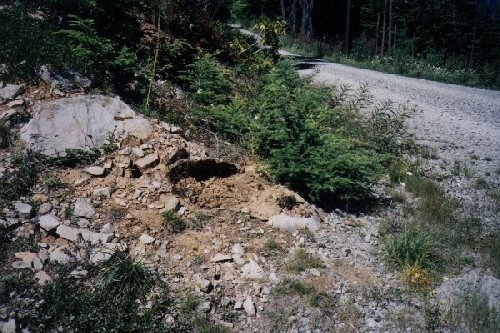 Second, I had seen a hole next to the road that was unusual. A rock had been pulled from the ground and was gone, just gone. It had to weigh at least 200# from the size of the hole. The next thing that bothered me about the missing rock was that the hole showed a clean pull out. There was no sign of prying or the use of chains or ropes. The edges of the hole were sharp and crisp all around. In addition, the rock was just the common variety sandstone type from up there and wasn't special for paving or a collection. Where had it gone? I looked all around for some distance and then went into the rhododendron field down slope. No rock. I needed to come back and measure this up and get a witness. Didn't have a tape with me. Took a picture. I picked up a sample rock of what was probably the same material - the rock seemed common in the area. The sample rock was substantially less than half the size of the hole. When I got it home, it weighed 84#. Of course, it got promptly put on the rock pile. Then I found some more strange rock doings further down the Butte near the intersection of spur 125. I had stopped to look at the mossy scree and off to the west side of it I noticed a crude fire circle. It had not been used and there was no wood of any kind gathered near it. 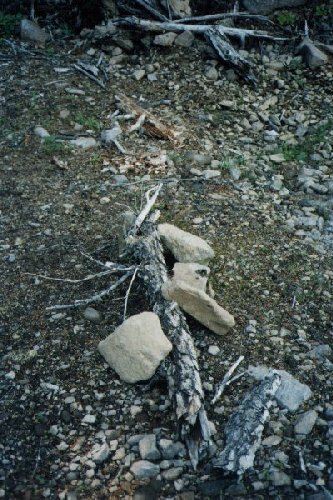 A few feet from the fire circle, there was a knot of wood about 18" long and 3" in diameter with some rocks sort of stylized stacked around it. Then there was a line of several stacks of stones about 6'-10' apart. All of the stacks were of three stones about fist-sized. All in all, it looked like a kid mimicking the building of a fire pit. The really unique thing about the whole area was that there was no evidence of people. It was sparkling clear of human debris. There were no bottle caps, no cans, no cigarette butts, no scraps of paper, no spent firearms cartridges, no tire marks, no nothing. 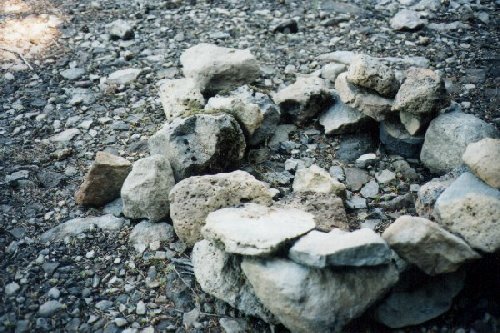 Over on the rock scree, there were stones that had been piled up on the top of a boulder from the shoving done by the road crew. The whiteness of the stones indicated they had been laid since last winter. This was all very bizarre and I determined to get Steve or Cliff back up there to see this stuff as soon as I could. We certainly had to get back up before deer season started in a couple of weeks.